Sam Antar is a convicted felon and a former CPA. As the CFO of Crazy Eddie, Mr. Antar helped mastermind one of the largest securities frauds uncovered during the 1980s. Today, Sam Antar is a forensic accountant. His primary work focuses on identifying and investigating public companies engaged in securities fraud by performing an in-depth (deep-dive) forensic analysis. He advises law enforcement agencies and professionals about white-collar crime and trains them to catch the crooks. His clients include government agencies, law firms, accounting firms, independent investment research firms, hedge funds, public companies, and other organizations. In November 2018, Entertainment One announced that it is developing a movie called Insane, based on the Crazy Eddie fraud. Peter Steinfeld wrote the screenplay. Greg Berlanti, Sarah Schechter, Peter Steinfeld, DeShawn Schneider, Mandy Stein will produce the movie with Sam Antar serving as an Associate Producer. Michael McGrath will oversee the project with Schechter for Berlanti Productions. Entertainment One plans to start production in the spring of 2019. 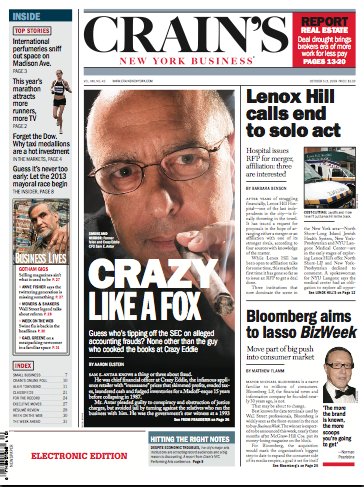 Crazy Like A Fox, Crain’s NY Business, October 5 – 11, 2009. Click on image to view article. Sam Antar’s “White Collar Fraud” blog investigates white-collar crime, securities fraud, accounting irregularities, corruption, and other related topics. Material from his blog has been used in investigations by the Securities and Exchange Commission and in class action lawsuits filed against certain public companies for improper accounting practices. In December 2008, Mr. Antar’s blog was recommended by the Journal of Accountancy. In August 2009, he testified as an expert witness on corruption for the New Jersey State Assembly Republican Policy Committee. In June 2012, the Huffington Post named Sam Antar one of the 25 most dangerous people in financial media (“dangerous in a good way”). Mr. Antar’s views on white-collar crime are frequently quoted in the print news media, online news media, TV media, radio media, professional journals, books, and blogs. He has appeared on CNBC, Fox News, Fox Business Channel, WSJ Live, British Broadcasting Corporation, Canadian Broadcasting Corporation, Canadian Business News Network, National Public Radio’s Planet Money, Progressive Radio Network, Reuters TV, RT News, and other media outlets to give insights on white-collar crime. His commentary has been published by Business Insider, CNBC, Newsweek, Seeking Alpha, TalkMarkets, and other publications.